I've posted some pictures on the link "Midwest 2010". 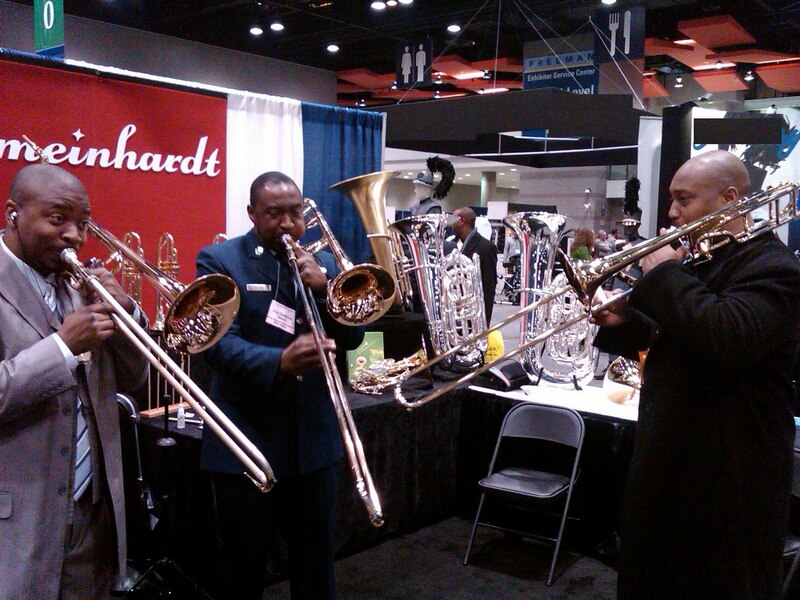 Our trombones atracted considerable attention. Serveral top players were impressed by the versatility of the patented Dual-Use mouthpipes. Three top players who met for the first time at the booth did an impromptu mini concert to the delight of all in ear-shot. One insisted on taking a trombone home with him. I hope to post a video of the jam on youtube soon. The tubas attracted lots of attention. I think we finally have the right angle on the J-870 CC tuba. 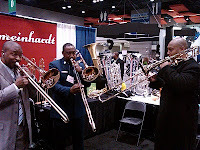 There were no negatives and players commented that the J-700 and J-870 were the best tubas at the show. Many college students expressed interest in stepping up to the D-880 or D-780 French horns. I hated to tell them that the cost was actually less than the big brand name they were looking to sell so they could make the move. Next show is NAMM in Anaheim mid January followed by the Capitol Tuba Conference at Ft. Meyers in DC.